Coral Island is an easy 15-minute boat trip away from Phuket’s southeastern coast. Though Coral’s main beach gets busy with day-trippers, if you plan it right it’s possible to enjoy the island in the idyllic glory promised on the postcards. Known locally as Ko Hei, Coral Island has two sandy beaches lining its shore, backed by jungle-clad hills. 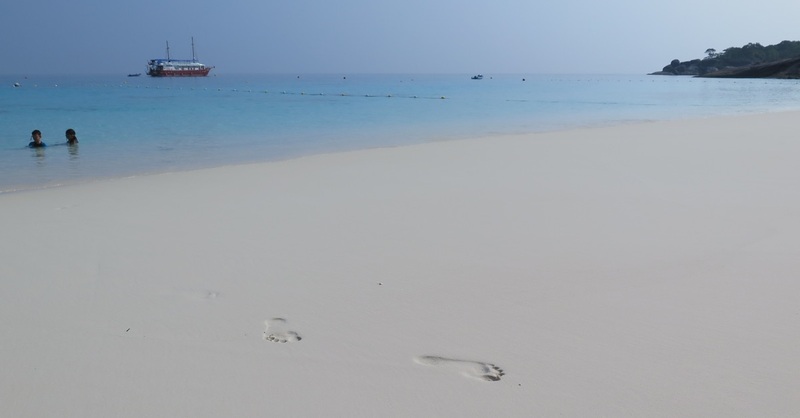 It’s uninhabited with no roads, but the island’s abuzz with families and tour groups who arrive to shore daily by speedboat in the late morning for a few hours of playing on the sand, banana boating and parasailing. Dive trips and lessons are on offer here, too. Non-divers might want to try the snorkel tours organised by Coral Island Club, which has SASUBA (Surface Air Supply Underwater Breathing Apparatus) and blade fish gear to help snorkellers explore further and deeper. Not the worst place in the world: Coral’s Banana Beach. Most of the action is on Long Beach, a one-kilometre stretch of white sand, with rocks offshore at each end for snorkelling. The various tour companies have set up their own little sections along the beach with shaded beach chairs and snorkel equipment for their guests. There’s one rustic shop selling souvenirs as well as renting out snorkel equipment. Long Beach is where the island’s only choice for accommodation is found: Coral Island Resort, a collection of basic air-con concrete bungalows and rooms set around a swimming pool. The price depends on the bungalow’s proximity to the beach, but none are more than a two-minute walk away. When we last visited (December 2012), the resort was busy painting and fixing up the rooms, and they were looking a lot more cheerful. The resort restaurant puts on a buffet lunch, which is nothing to write home about, and has a Thai menu with cocktails and beer. At one end of the beach is another restaurant called Komodo. You’re extended an incredibly disinterested greeting on arrival, and it has standard Thai fare, but the big attraction here is the “komodo” sighting. Every so often the restaurant staff will hack up a raw chicken and throw the meat bits over a low fence behind the restaurant. Before the chicken even hits the ground a family of monitor lizards make a thunderous appearance as they amble down the hill for their daily snack. One of Coral’s well-fed monitor lizards. At the other end of the beach is a small trail that leads to Banana Beach, about a 10-minute walk away through the jungle. It’s not a difficult walk but there are steep drops off the side in places so young children will need to be watched closely. Alternatively, you could rent a kayak from the resort and paddle over. Banana Beach is not quite as spectacular as Long Beach, and its sand is a shade darker, but it’s quieter and there’s better snorkelling in its offshore coral. The best way to avoid the Coral Island day-trip rush is to arrange your own boat trip, either by chartering a speedboat or hiring a longtail, easily arranged at Chalong Pier, Rawai Beach or local agencies. Arrange your trip directly with the boatman, or if you stop by any tour agency in Phuket you’ll be able to sort out a join-in trip or boat charter. 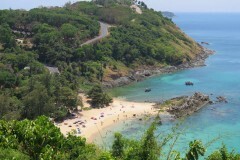 Several trips combine a visit to Coral and Ko Raya (also called Ko Racha). If you have a large enough group it might even be cheaper to arrange your own trip than the join-in boat tours, though you’ll have to sort your own food and snorkel gear. We were quoted a price of 9,500 baht for a speedboat for 10 people to 17,000 baht for one with a 35-passenger capacity. Beachfront dining at Coral Island Resort. After about 14:30 all the tour groups are gone and there’s a better chance of spotting the island’s resident hornbills in the evening hours, too. Bliss.